Following publication of the World Map of the Satus of Human-induced Land Degradation (GLASOD), at scale 1:10M, the need for more detailed and more country-specific degradation assessment became apparent. 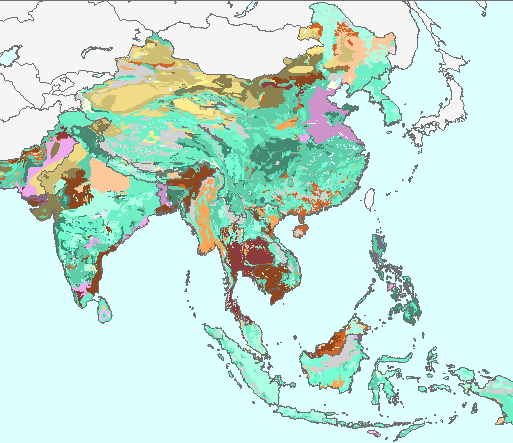 In 1993, the members of the Asian Network on Problem Soils recommended the preparation of a qualitative assessment for South and Southeast Asian at a scale of 1:5 million. The assessment was ... carried out using a physiographic base map, compiled according to the SOTER methodology, and a slightly modified GLASOD methodology. The information was stored in a digital database and linked to a GIS enabling preparation of thematic outputs in the form of maps, graphs and tables. 3120844a-f73c-4bf2-b522-32f73a85d669 Access to the portal Read here the full details and access to the data.